Kochi: Kerala would now have to fight a new battle as it vows to go for the construction of a new state: the waste. And the largest component in the waste dump will be nothing other than plastic, going by the trends now. Adding to the heap is the waste that will come in huge amount in the form relief materials. 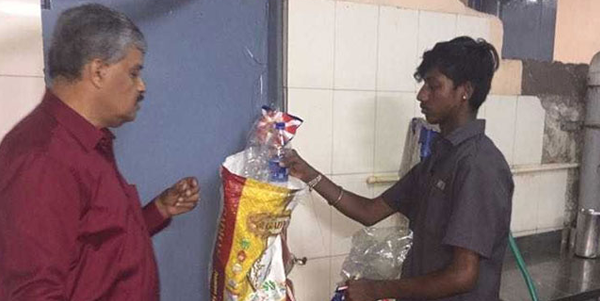 A 33-year old Kerala youth working in Bangalore on Tuesday launched a plastic waste management programme which offeres a scientific soution to the probelm. The initiative which was announced on the social media has got huge responses from different people all over the world, the youth, V.K. Roshan, said. The facebook post appeared on his wall was later shared by actor Tovino Thomas, which sent the post viral. According to Mr Roshan, the idea was first come to his mind after his team in Bangalore dispatched a truck-full of relief material for the flood-victims in Kerala from Bangalore. “I was aware that the plastic packets and containers are going to be waste materials after use. I talked to the executives of two waste-recycle companies who agreed to collect and recycle those wastes. I have decided to take all of them back after use including those are currently there,” he said. Mr Roshan got support from various district administrations, and government organisations. “Officials from the Haritha Kerala Mission and various district administrative officials encouraged me and promised me support,” he added. He had also posted a graphical representation of the programme where a 25-member team will be deployed in each district to collect the materials with two collection points. “As Ernakulam is the worst affected, we are planning to deploy around 50 volunteers,” he said. Over 150 volunteers have already sworn in for the programme in various districts. The Haritha Keralam officials lauded their initiative. This is a good effort and it will be a great relief for the people and the authorities who handle waste management,” said P. Ajayakumar, Technical Officer, Haritha Keralam. Although many have willingly come forward to be volunteers in different districts to be part of the programme, Mr Roshan finds it difficult to handle it in the future. “Kottayam, Ernakulam, Alappuzha, Thrissur, Kozhikode and Malappuram are ready with the volunteers. As it would be a tough and very long term task, I request state government’s help for this,” he said.